South Africa has some impressive farm stalls. Some sell nothing more than fresh produce while others are for all intensive purposes a restaurant or curio shop along a high way or back road somewhere. Its the ones in between that really interests me. Those who sell something fresh, some curios and also serve a killer meal, even if its nothing more than roosterkoek with jam and cheese. And coffee. Lets not forget coffee. I discovered a farm stall like this on the road between the Crags and Natures Valley on the Garden Route on a recent Sho't Left to the area. 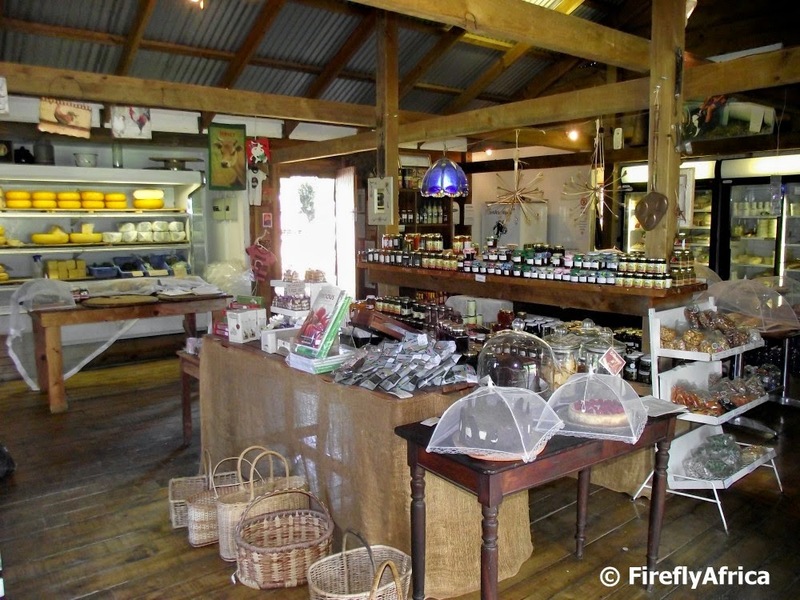 Natures Way Farm Stall isn't a curio selling shop but rather one that focuses on fresh and home made goods. We were in the area for four days and every morning they had the freshest home made breads and cakes, fresh milk on tap straight from the dairy on the farm the farm stall is located on, jams, dried fruit and a range of dairy products. They also serve meals, cakes and... coffee on the stoep. 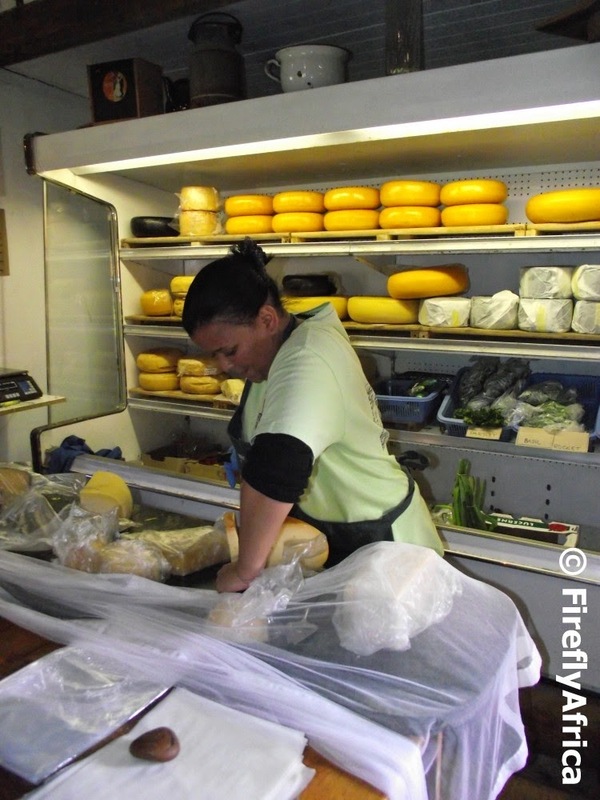 The farm stall sells a range of cheeses made either on the farm or in the area, most made from their own milk. The problem with a farm stall like this is that my wallet can't handle everything my eyes want. I wouldn't mind having access to fresh milk on tap every day. Koningstrand is een van Port Elizabeth se bekendste en mees gewilde strande en strek van die hawemuur tot by die McArthur swembadkompleks. Die naam kom vanaf die Britse koninklike besoek van 1947 toe die koninklike trein langs die strand getrek is en 'n deel van die strand blykbaar omhein is vir die ekslusiewe gebruik van die koninklike familie. Die prinsesse het op die strand gaan perdry terwyl die koning ook daar gaan swem het. 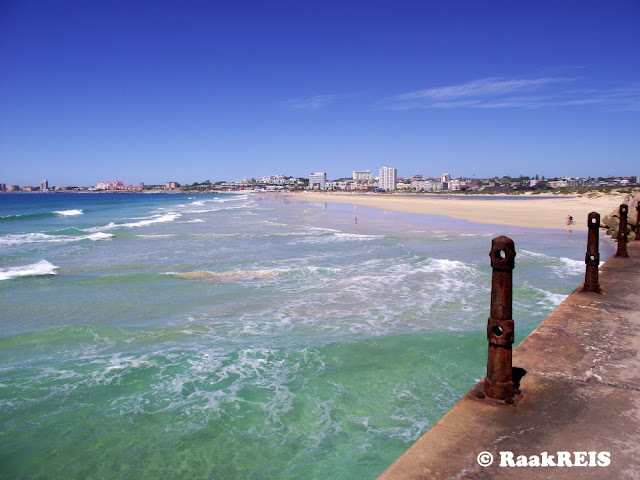 Plaaslik is begin om na die strand te verwys as die koning se strand en vandag is dit bekend as Koningstrand. I remember when I was about 8 or 9 I got to see a cow give birth on a farm I went to with my grand parents. Its something I never forgot and I always wondered if my KidZ, being city kids, would ever get the opportunity to see it happen. During our Sho't Left Easter weekend at the Crags we visited the Natures Way Farm Stall across the road from the campsite a couple of times. Natures Way is situated on a commercial dairy farm and they kept the pregnant fairies in a camp next to the farm stall. The day we got there two cows have just given birth and we were hoping that one of the other three would calf before we left. Drama Princess went to check every day but it didn't look like we were going to have any luck. A couple of minutes later he started to lift his head while his mother was licking him. I probably would have taken a couple of minutes as well if somebody just yanked me from my mother by my arms. I think of all the experiences from this weekend this is the one that will stay with the KidZ for the longest. Something most city kids never get to see. 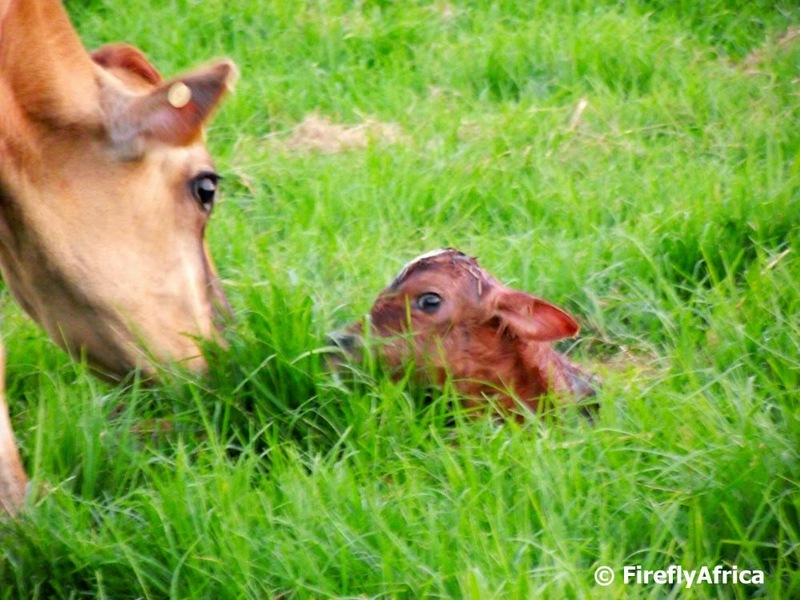 The birth of a calf, an unforgettable experience. Tourism in South Africa isn't just for international visitors but also for locals. Yes there are places that most locals would never be able to afford to visit, but there are more places that are affordable to visit and even more things that you can do that actually doesn't cost you anything. South African Tourism encourages locals to travel through their Sho't Left campaign. "Sho't Left" is derived from everyday South African "taxi lingo" where a commuter wanting a ride to a destination close by will say, "Sho't left, driva!" - meaning, I want to jump off just around the corner. So a Sho't Left excursion or holiday would be seen as a short affordable holiday not too far from home. 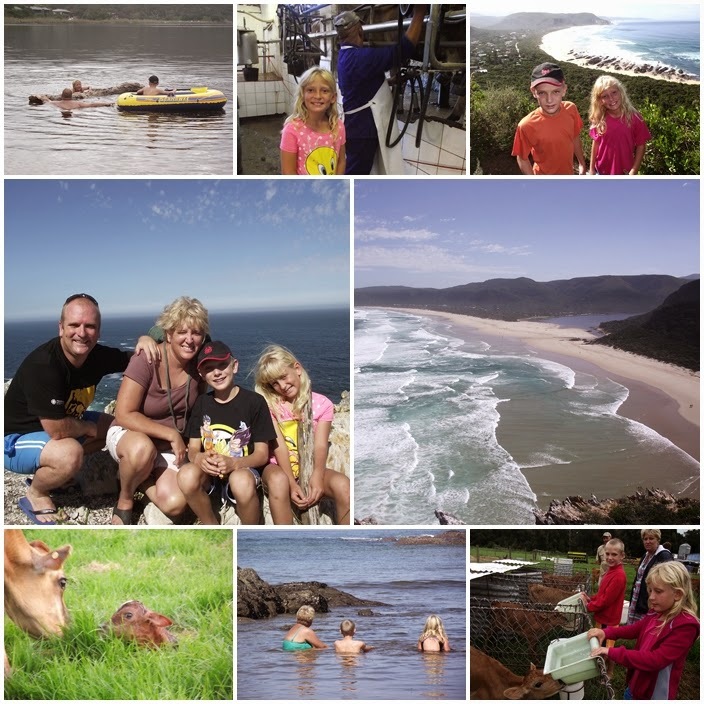 Over the Easter long weekend we decided to take do a four night camping holiday - our Easter Sho't Left - at the Tsitsikamma Sunrise Caravan Park between the Crags and Natures Valley. Except for the R320 per night for the camp site the experiences we had cost us nothing except for the petrol to get down into Natures Valley. 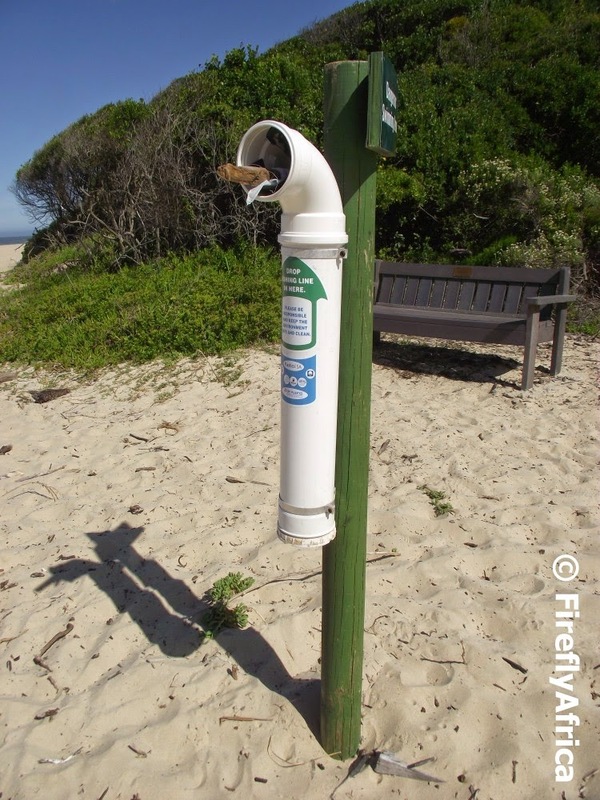 We Geocached, climbed the Point (also the last bit of the renown Otter Trail) east of Natures Valley, hiked to the Salt River Mouth west of the village and spend lots of time in the Groot River Lagoon. 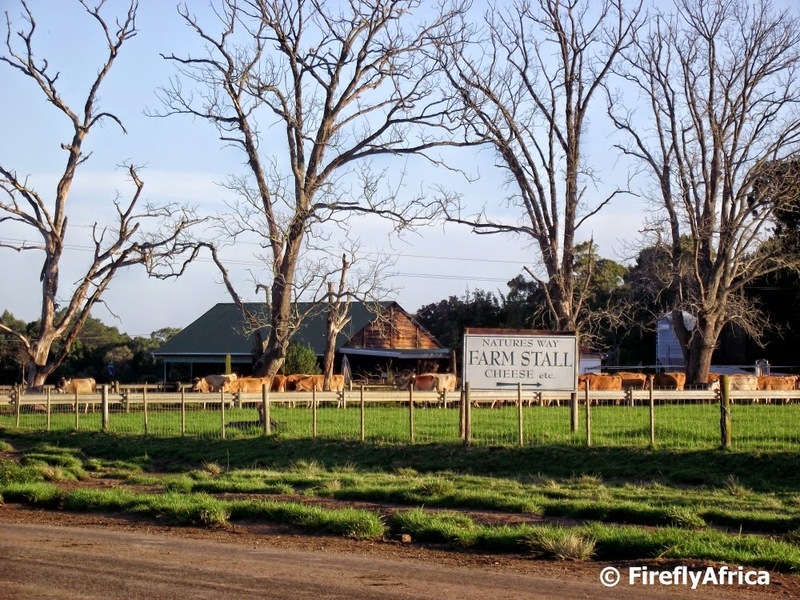 Across the road from the camp site is Natures Way Farm Stall, situated on a commercial dairy farm. We got to see how they milked the cows every afternoon (at no cost), the kids got some hands on experience with the milking process, feed the calves and on the last evening actually got to see a calf being born. Priceless experiences that didn't have my wallet heaving. As soon as I get a chance to edit pictures, upload them and write something I will post about all of these wonderful experiences we had at Natures Valley. This Sho't Left holiday was done at our own cost and no part of it was sponsored. The lakes district between Knysna and Wilderness on the Garden Route is made up of a series of lakes, most of them visible from the N2 itself. Out of all those lakes, Groenvlei - just east of Sedgefield - is the only one that is a fresh water lake and without an inlet or an outlet. The lake is maintained by rainwater and springs alone. There are very strict restrictions on boating on Groenvlei with only electric motors, and no outboard motors, allowed. The lake contains largemouth bass and is one of only a few lakes in the country that has them occur there naturally. Geocaching is the ideal activity for people who love to travel and discover new places. Yes I know I've said it before and I will say so again many times in the future. 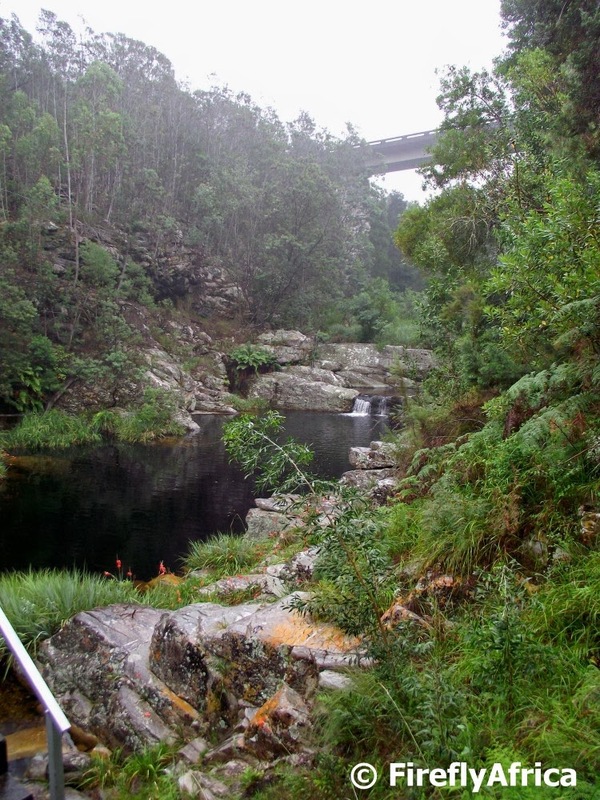 On a visit to the Tsitsikamma I went in search of a cache called Elands Delight (GCX2QF) and even though it was raining (yes we geocache come rain or shine) I was very keen to find it. The coordinates took me onto the old road a couple of kilometers east of Storms River Bridge and down a steep set of cement steps into the Elands River gorge. WOW! What a beautiful spot. 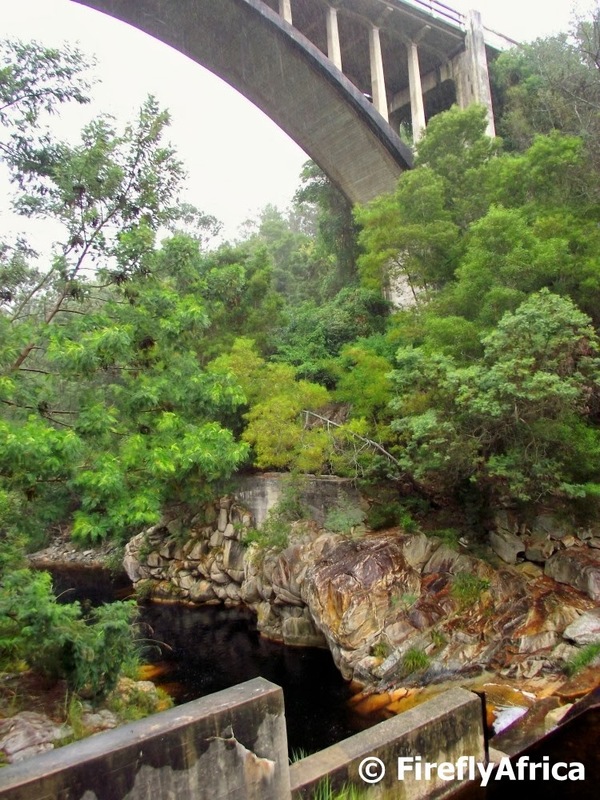 I really have a very soft spot in my heart for the Tsitsikamma and discovering a place like this was very special. At the bottom of the gorge is a weir damming up the black forest water of the Elands River into a swimming where I'm sure the local kids hang out on warm days. Looking up to the left (top picture) is the old bridge and to the right (above) is the N2 bridge. I really would have liked to spend some more time but by now I was soaked and didn't want to get my camera too wet. In the words of the Terminator... "I'll be back". My previous post was a picture from a scenic lookout spot in Plettenberg Bay looking towards Robberg. I mentioned that the view to the left is of the Beacon Isle Hotel and the Piesang River Estuary. 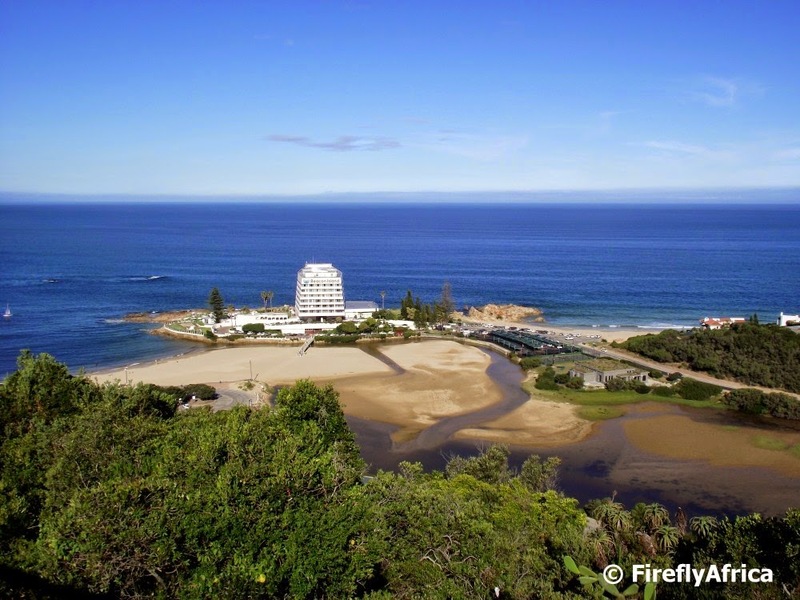 This iconic spot is now under threat of a huge development that started out as an request for ideas for a small boat harbour which has ballooned to a multi billion rand development that will change the landscape of Plettenberg Bay for ever. In my opinion, not for the good. I borrowed this picture from Show Me Plettenberg Bay. 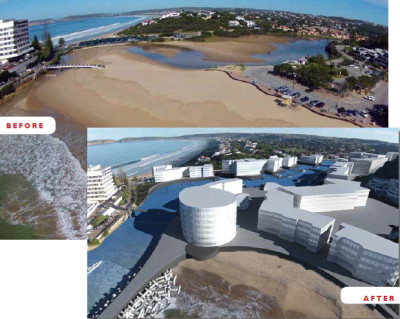 Check out their article on Save Plett, Central Beach, Plettenberg Bay. Driving past Plettenberg Bay on the Garden Route means you catch a glimpse of the Keurbooms Lagoon with the bay beyond but you don't actually get to see much of the town and surrounds. 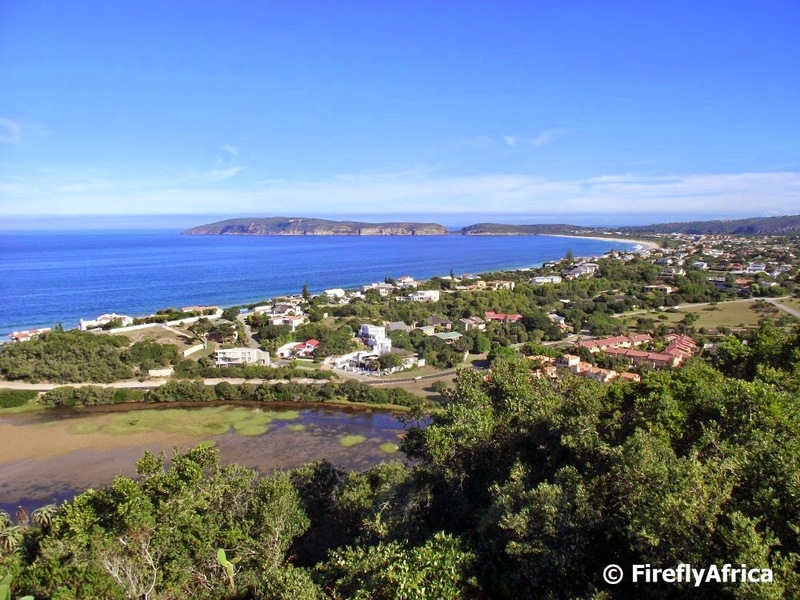 Plettenberg Bay wasn't originally called Baia Formosa (beautiful bay) for nothing and the best spot to enjoy a scenic view of the area is from the lookout reached by driving up Main Street from the town centre and turning left on San Gonzales Street. The view point gives one a bird's eye view of Plett with the bay on the left, part of the residential areas on the right and Robberg Peninsula in the background. The view immediately to the left of this takes in the Beacon Isle Hotel, but I'll share that with you another time. Spending the weekend at Ann's Villa just north of the Zuurberg Mountains in the southern Karoo, I discovered this little dude enjoying the afternoon sun. He allowed me to take out my camera and snap a couple of pictures of him, even lifting up his head for a better pose. Now I'm not a lizard expert but I'm sure it's a Agama. Whether it's a Southern rock agama or a Blue headed tree agama I'm not too sure. Going by pictures I have found on the net I'm going to assume (and it's always dangerous to assume) that it is the former. 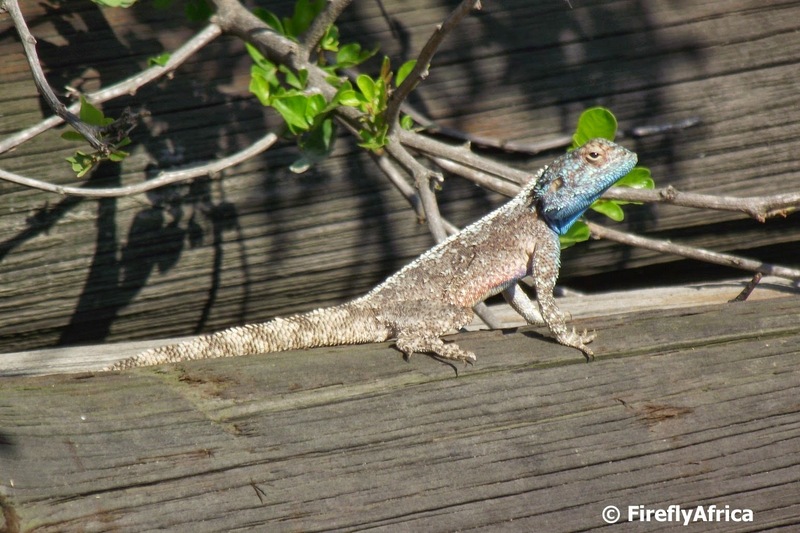 The Southern rock agama (Agama atra) is a species of lizard from the Agamidae family and occurs in South Africa. They normally live in small colonies on rocky outcrops with the males having bright blue heads. 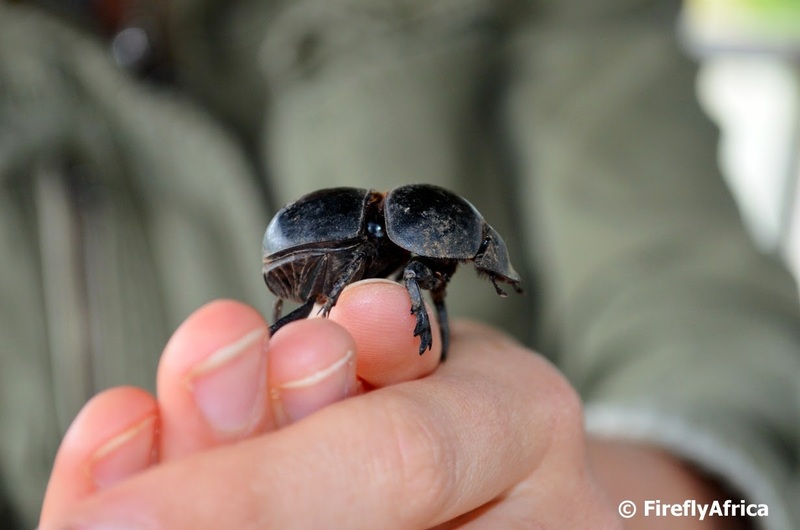 The females and young are a more uniform greyish-brown and are much more shy. They can grow up to about 25 cm and has a thin dorsal crest that runs the length of its body. The Agama's natural predators in the wild include the fiscal shrike and various snakes. 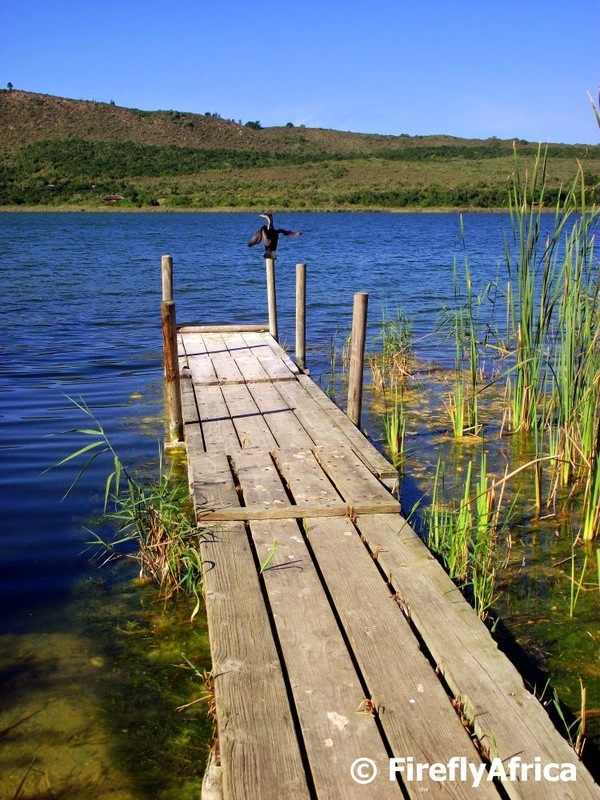 The area between Sedgefield and Wilderness on the Garden Route is known as the lakes district with five lakes found here. The biggest of these lakes is Swartvlei just to the west of Sedgefield. Swartvlei is the only one of these lakes that embraces a lake, lagoon and estuary and is clearly divided into a fresh water section in its upper region and a salt water section in the estuarine area where the tides have an influence. The main Swartvlei lake visible on the left as you drive eastwards on the N2 is a drowned river valley created 16000 - 45000 years ago by the merging of three rivers, the Hôekraal, Wolwe and Karatara. The waters gradually receded to a lake in the deepest depression and is darkened by the humic forest vegetation through which the rivers flow. My last trip down to Cape Town from Port Elizabeth took a slight different form from the usual. Normally one would barrel down the N2 trying to cover the distance as quickly as possible but on my last trip down I decided to turn off into each of the towns along the N2 through the Overberg for a closer look. The one thing I do when I get to a new town is to look up the local historic Dutch Reformed Church (DRC) which often is one of the main reasons these towns got established. The first town I stopped in was Riversdale. 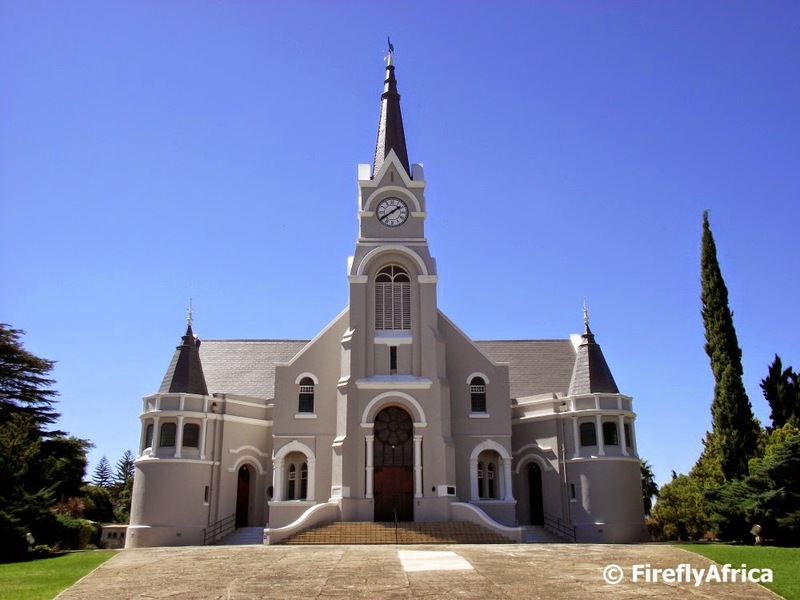 Riversdale was established as a new parish on the farm Doornkraal by the DRC of Swellendam in August 1838. The town on the banks of the Vet River near the foothills of the Langeberg was named after Harry Rivers, Commissioner and Resident Magistrate of Swellendam from 1834 to 1841. 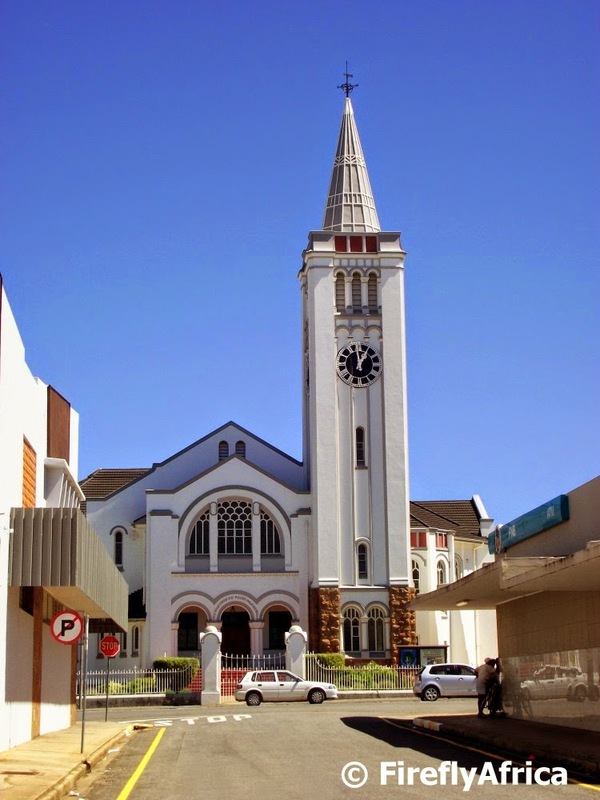 The present church on Church Street was built in 1907 and has an organ which was imported from Scotland at a cost of R1 800 at the time. My next stop was the town of Heidelberg on the banks of the Duivenhoks River. 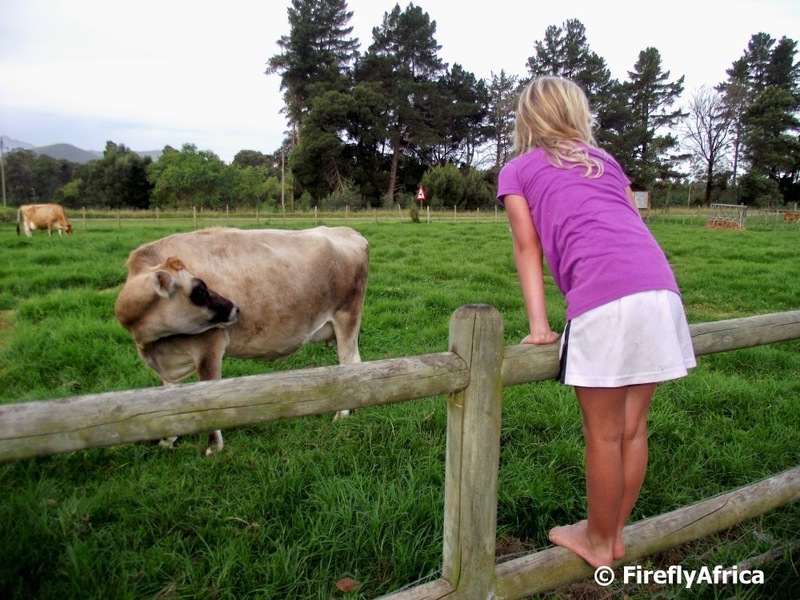 The first Dutch arrived in the area in 1725 and Andries Gous received a grand for the farm Doornboom. In September 1855 the Riversdale church council bought a part of the farm Doornboom on which to lay out a town. They named it Heidelberg after the city in Germany, the source of the Heidelberg Catechism and, like the new Heidelberg, built on the banks of a river. The beautiful Dutch Reform Church with its Gothic architecture is in the center of the town and was built in 1914, celebrating its centenary this year. 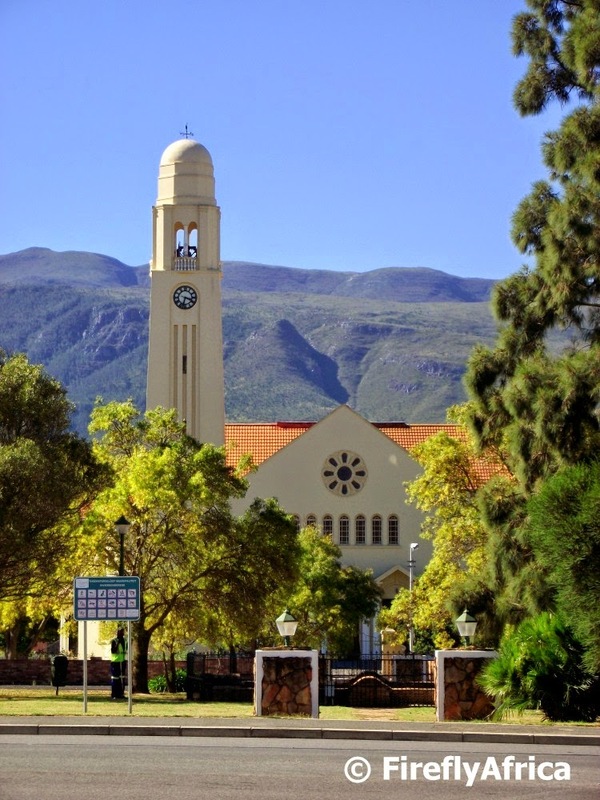 Swellendam is the fourth oldest town in South Africa and was declared a magisterial district in 1743. The town was named after the governor of the Cape and his wife, Hendrik Swellengrebel and Helena Ten Damme. By 1795 the local burghers was tired of the maladministration and inadequacies of the Dutch East India Company and decided to revolt, declaring themselves a Republic. This didn't last long though as the British occupied the Cape later that same year. 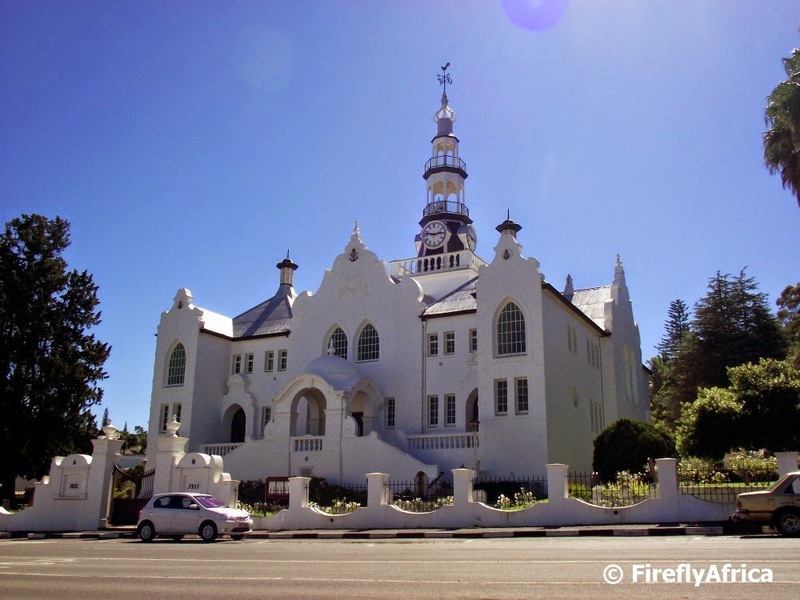 The very unusual Dutch Reformed Church as you see it today was completed in 1911. Built in an eclectic style, the gables are baroque, the windows Gothic, the cupola vaguely Eastern, and the steeple extravagant. Surprisingly, all the elements work together wonderfully. Inside is an interesting tiered amphitheater with banks of curving wood pews facing the pulpit and organ. The town of Riviersonderend doesn't have a lot of history attached to it and was only established in 1922 when the farm Tierhok was sold to the church council when the local DRC congregation was established. The church stands on the N2 and was built that same year. I wonder how many people drive through in such a hurry that they don't even notice it. 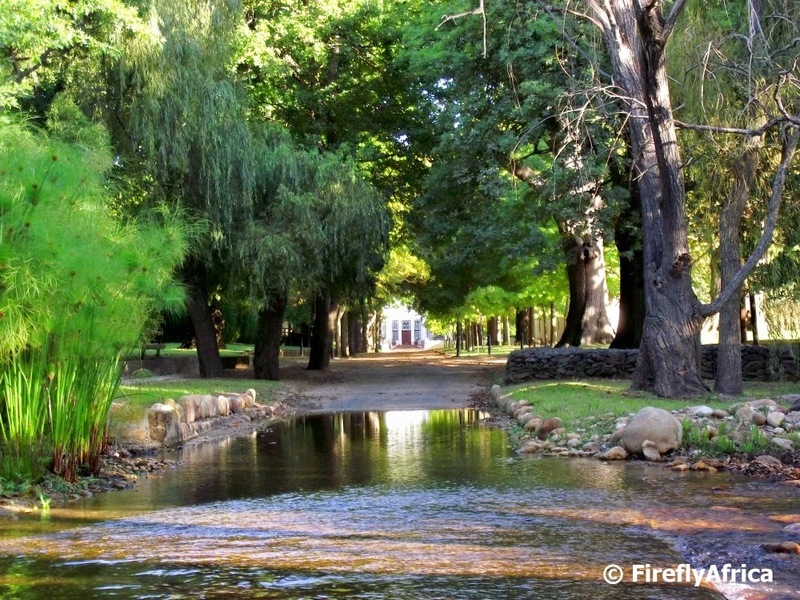 The search for a Geocache while visiting Somerset West took me to a beautiful spot I probably wouldn't have seen otherwise. Travelling down a narrow road I came up to a closed gate and parked the car. Walking through a side gate this was the scene waiting for me. Turned out to be the old entrance into Morgenster Wine and Olive Estate. Although the property on the other side of the river was private property, this side of the river had trails running up and down the river and I encountered lots of locals walking their dogs along these trails. Looking for the cache meant using "Top Gun 007" stealth mode and my camera was the perfect alibi for hanging around the one spot for so long. Looks can be deceiving. You tend to think young pretty girls would only be interested in fashion, nightlife, tanning on the beach, spending time in the shops and hanging out with their friends. Yes, yes, I know I'm generalizing but I'm trying to get to a point so bare with me. 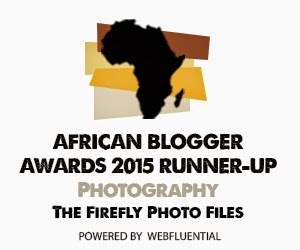 Late last year I hosted a travel blogger visit to Port Elizabeth and the surrounding area and the first blogger of the five to arrive was Rachel Lang, known online as Bush-bound Girl. She wasn't quite what I was expecting, not that I know what I was expecting. Rachel was the perfect travel companion a blogger can ask for. She had endless enthusiasm and jumped at every opportunity to participate and try out things. This made for great "experience" photos, plus the fact that she's a beautiful girl helped as well. 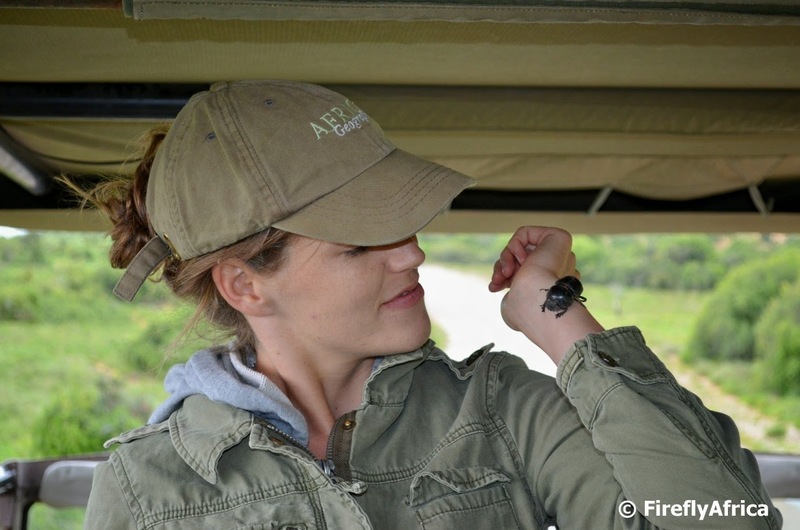 On our guided game drive in the Addo Elephant National Park our ranger stopped and picked up one of Addo's famous Flightless Dung Beetles. Who immediately asked if she could hold it? Nobody other than Bush-bound Girl.